(it looks like Arachnospila sp. to me). The post takes you through the full process of making the cake, along the will the intricate steps and various photos. What a beautiful result! Apartment Therapy (ever heard of them? A great read!) has an interesting article up today about becoming a backyard beekeeper. As food prices rise and people get more interested in sustainable food sources and living-off-the-land, beekeeping is going to become more and more popular in suburbs and cities. Beekeeping is actually really fun–and you get to eat the local honey you produce. It does take some intense work, however, especially during peak seasons, but I personally think it is well worth the challenge. Warning: if you are allergic to bees, you should not attempt beekeeping under any circumstances! Seriously! You’d be surprised at how many people I know who have gotten into a bad situation doing just that. Once I get some land, my beekeeping will shoot up. I can’t wait! According to the article, rental fees for bee hives, which farmers use to polinate acres of stone fruit crops for maximal fruit set, have risen from $55 per have a few years ago to $200 per hive currently. Who knew people would pick up on the profit margin here? It takes a brave criminal to grab a fully buzzin’ beehive. I don’t know about you, but most of the people I know still panic when an innocent worker bee visits a picnic. These guys must have balls of steel. This is a neat group–it shows the process bees go through to make a hive. Love it! Bee Man on Dirty Jobs! So I’m lying in bed, recouperating from my surgery, and I turn on Discovery, right into Dirty Jobs, season two, when he is in Cupertino, CA (near my house! Woo!) with The Bee Man. They remove a huge (and I mean ginormous!) bee hive from a wall of a parsonage. Check it out! Scientists have discovered a new way ants control their farmed food source: aphids. It has long been known that certain ant species have domesticated aphids, and use the piercing-sucking insects for their honeydew (mmmm…honeydew….). It was once thought that aphids stayed in the protection of the ants because the ants were able to fight of natural predators, and ants routeinly gnaw off aphid wings to keep them from flying away. Scientists found recently, though, that the same chemicals in the ants’ feet that they use to mark their territory, have an affect on aphid behaviour. Aphids walking over the chemical become sluggish and don’t move as quickly as aphids not exposed to the chemical. Interesting! 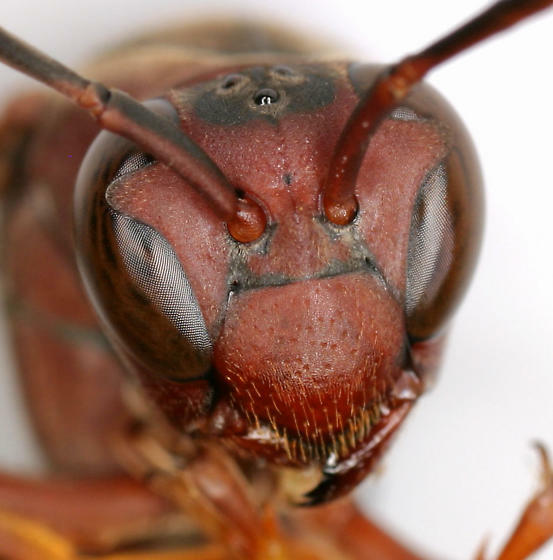 Scientists have discovered that the basis of eusociality (the tendency of sterile females to raise the young of a common queen) found in bees, wasps, and other social insects is genitically based. Lots of study has been done on Apis meliferia, or the European Honeybee, but very little has been done on wasps. This particular study was run on Polistes metricus, (family Vespidae) a rather primative wasp. Investigators used their knowledge of Honeybee genetics to identify the materinal gene in the wasp’s genome. Given that it was the same as the honey bee’s, they found that the tendency to be eusocial is an evolved trait that ensures the genes are passed on from generation to generation. The Independentis reportingthat scientists in Poland have discovered something interesting about ants: they can predict their own deaths. Apparently the amount of carbon dixoide in their blood gives ants a heads up as to when their final time has come–and it affects their behavior. Ants that are about to die take more risks than younger ants by foraging further for food and what not. Live Like You Were Dying anyone?